New user, love the interface so far! I’ve managed to change the aisle names to numbers, and have imported my grocery list from another program. Import went smoothly, and all my items are there in the Pick List, sorted by Aisle. The way I like to use a shopping database is to have my list sorted alphabetically by item name when I’m home checking off what I need, then sort it by aisle number when I get to the store. Is there a way to have the Pick List sorted by item name? Hi Amy, thank you for your feedback and your question. Unfortunately, there is no convenient way to do what you describe yet. However, we have Pantry app/feature planned later this year which may come handy to manage your stock and organize products to how you keep them at home. Apparent Bug: When in (All) Pick List, if I touch an item it is selected (as it’s should). However, if I accidentally touched it, and then touch it again to un-select it, the item disappears from the Pick List. I can get it back by doing an “Un-do”, but then the item appears twice, and I have to delete one of them. Not a Bug, but a request: When editing items in the pick list, would it be possible to return to the same place in the list after finishing the item edit? Hi Phil, thank you for your feedback. Though it seems confusing, the first part of the described behavior works as designed. When you uncheck an item in pick list which only exists in the current list, it will get removed. It’s because a new item from shopping list will be reflected in “Automatic picks” section of Pick list configuration until the item present on the list or history. Some more details are available in Settings User’s Guide. As to the second part, unfortunately the item won’t get duplicated after Undo for me so I would appreciate if you could suggest steps to reproduce the issue starting with creating a new item. Thanks for suggesting another pick list improvement. As a side note, I would recommend using Settings –> Pick list –> My Picks to manage your new products. Hello. Have been using your program for some time (full version) and quite like it, but there are few moments that I can’t figure out. My goal is to create particular “my pick lists” for few shops. Let’s say shop A and shop B. I want to add the same item to each shop list with particular price. For example, bananas in shop A cost 5$ and in shop B 4$. At first I go to “Aisles” and make shop A and shop B lists customized. I copy few aisles from “AnyList'” and through editing I put parent for each aisle to blank. Then I go to “My picks”, choose Shop A and try to add an item. If i type bananas it goes to all lists. Few times I managed to make independent items per a list, but I couldn’t get the point how they are managed. It is mystery for me. Could you please clarify? And why in a pick list I cant change “shopping list” in edit mode? Also Russian translation of the program interface is highly expected by many people. I’ve added two identical items with different prices to shop A Picks and Any List Picks. Though I still don’t follow the logic. Now I go to the List and select Shop A List. I press add and find bananas. And it adds bananas but with the price of AnyShop picks, not Shop A! What am I doing wrong? Hi Alexey, thank you for your feedback and your considerations. Unfortunately, as of today, the app would normally expect only one record of “bananas” in the Pick list, that’s why the may incorrectly pick up row from the different store. Until we introduce a better model, you may want to create two slightly different records i.e. “Bananas 1″, “Bananas 2″. The other solution would be to unlink Bananas record which will allow different prices/aisles for items with the same name. More details are available in Linked and Isolated changes in User’s Guide. With use of unlinking it let me add the same name to different shopping list, but as I wrote when I go to lists and add the item bananas it picks it from wrong pick list. It’s a bit messy with same names, hope it will be fixed someday. So far I’d be better off not renaming them into bananas 1 and bananas 2 in different pick lists, but creating only one pick list (AnyList) with 2 different items: bananas shop A, and bananas shop B. But of cause the ideal situation would be the same name in 2 different pick lists. Keep fingers crossed it will be available in further versions. Thank you. Alexey, thanks again for your feedback. Hopefully, the Pick list changes will be introduced soon. Hi Keith, thank you for your feedback and your suggestion. 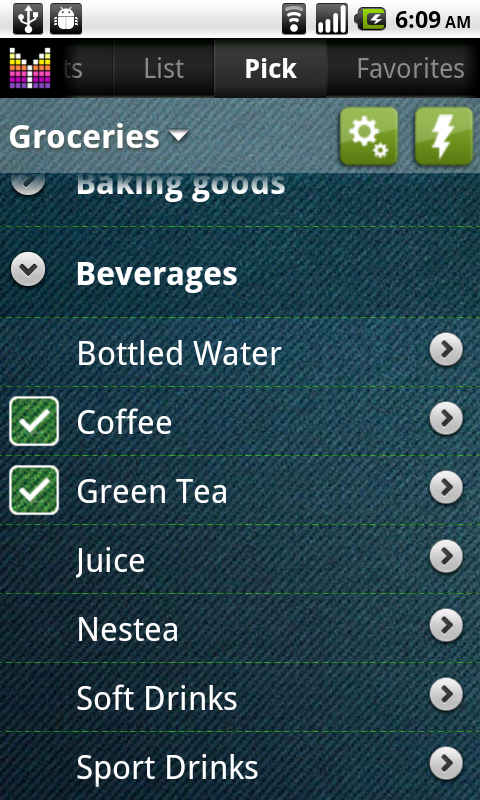 I guess the best solution for you would be a sort of pantry/inventory management app which would track your items at home. We have such an app in our 2011 plans, so hopefully it will match your request. I am wondering if there is a way to make the pick list shopping list-specific. For example, bananas can be purchased in different amounts for different prices at 2 different stores. I would like store A’s pick list to contain only store A’s bananas at store A’s banana price. And so on, for store B? Is there a way to do this? Ali, thank you for your question. Technically, yes, it is possible to organize list-specific pick list. Though, it is designed for cases when two lists have totally different set of products and aisles. To do that, just go to Menu -> Settings -> Aisles. 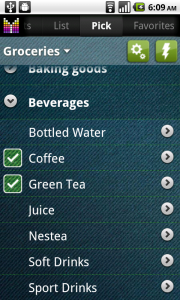 Then click Customize and select a list to customize aisles for. Then delete all aisles copied from Any List configuration to start from scratch and add aisles you want for a new list. After these manipulations, the second list may have a totally different set of products. However, from your example it sounds like you need Price Comparison feature which may be planned later this year. Hopefully it will also allow pulling prices from local stores and/or share pricing information with people in your neighborhood. I am running your app on my android phone and I love it but I can’t figure out how to get the tax to be included I have the % put in the settings but it doesn’t compute the amount? Hi Robin, thank you for your feedback and your question. By default, tax rate won’t be applied to items. To include tax in item total price, open Item Edit Details and click the Tax field to iterate through available tax rates. Long-press to provide individual tax rate for an item. Please have a look at the following illustration. How do I add a new item if one with the same name already exists? Example: I want to add pears but this item already exists as fruit but I want to add it as canned item. But I could not figure out how. Because everytime I enter pears in the search box the application offers the already existing item. Isn’t there a add button or something like this? Hi, Achim. Thank you for the question and feedback! Well, if I get your question right, you just need to continue typing in the search box, say “Pears Canned”. The app will offer you to create a new item with the name you provided. Though it will be addressed in “Other” aisle initially, you can change it to whatever aisle you want. Kindly notice that a new item will be now available via search/pick with the aisle of your choice. thank you for your quick response. You indeed understood my question perfectly right. And your answer was just what I needed. My pleasure! Feel free to get back with any questions you may have. Love the app!!! Was wondering if there is a way to keep the pricing information on an item when you un-pick that item? When I pick the item again it does not keep the previous pricing info. Hi, Steve. Thanks for the question and feedback! Unfortunately, keeping pricing information in Pick list is missing from the app yet. However we’ve got it on the future plan list under “Save item changes to Pick list” feature. I spent hours adding custom ailes and some of the new ones will not show up in the pick list. Can you help me get them to appear? Thx. Sure. Lets get it sorted out. First of all, do you have any items in new aisles? Aisles with no items won’t show up in Pick list. Thanks so much! That was the problem. I could not find where I posted this question so I sent an email. Please ignore. Love the app especially now that you solved this mystery! Judy, I am glad to hear that everything is all right now. How do you add a grocery item? Michael, thank you for your question. I just have updated this help page to address your question. Please let me know if any extra details are required.